Caroline MacDougall is the founder, creator, and CEO of Teeccino® Caffeine-free Herbal Coffee, the best-selling coffee alternative. With over 30 years’ experience in the herbal products industry, Caroline has designed numerous award-winning herbal beverages for top tea and natural product companies including The Republic of Tea, Yogi Tea Company, Uncle Lee’s Tea, and Organic India. Caroline began her career developing worldwide suppliers and importing herbs for Celestial Seasonings. In Europe, she furthered her education in herbal lore by apprenticing with a world-renowned herbalist, Juilette de Bairacli Levy. Caroline developed several European herbal product lines and brought many ideas back to the United States in the early ‘80’s. 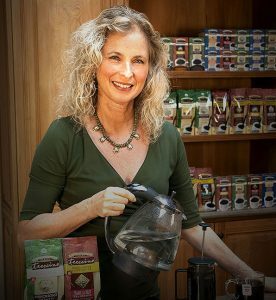 Caroline’s inspiration for creating her most innovative product line, Teeccino® Caffeine-free Herbal Coffee, came to her in a dream in the mid 1990’s when she was deeply involved in rainforest preservation work in Central America. Following in the footsteps of her great grandmother, Alice Foote MacDougall, a single mother entrepreneur who began a coffee roasting business which grew into gourmet coffee shops in the early 1900’s, Caroline founded Teeccino Caffé, Inc. in 1994 and launched the first Teeccino® flavors to the natural and specialty food markets in 1995. Caroline lives with her family in Santa Barbara, California near the mountains where she hikes when time permits. She is an avid yoga practitioner and has been a vegetarian devoted to healthy lifestyles for over 35 years. Her passion is to help others create optimal health!